It improves your memory. Your brain makes sense of all that you did and learned throughout the day while you’re sleeping. It helps regulate your weight. Sleep deprivation causes poor regulation of the hormones that control your appetite. Sleep is also the ever important fasting period of the day— if you’re staying up late and snacking you’re going to eat more than you would if you just went to bed earlier before you even got a craving! It can decrease your risk of diabetes. Studies have shown that sleep disorders or sleep deprivation increases your risk of developing diabetes. Prevents disease. 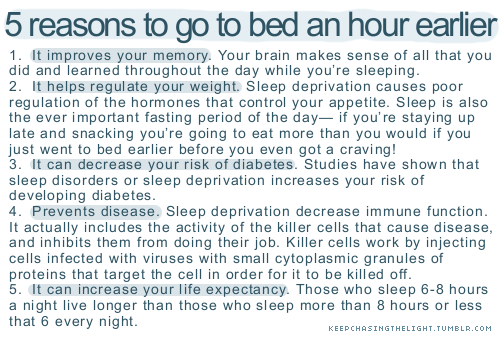 Sleep deprivation decrease immune function. It actually includes the activity of the killer cells that cause disease, and inhibits them from doing their job. Killer cells work by injecting cells infected with viruses with small cytoplasmic granules of proteins that target the cell in order for it to be killed off. It can increase your life expectancy. Those who sleep 6-8 hours a night live longer than those who sleep more than 8 hours or less that 6 every night.